I am very reluctant to products overly marketed in any way. Names with prefixes like hyper, super, the best, or the perfect will throw me off. 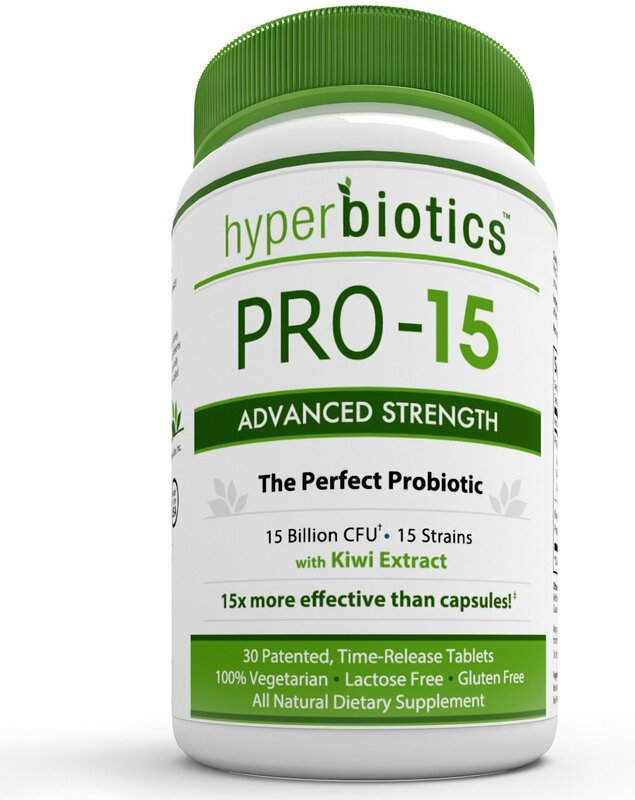 So that was my state of mind when I first learned about HyperBiotics Pro-15, The Perfect Probiotic. Like it wasn’t enough that the named it Hyperbiotics, they also had to say is the perfect supplement. Common guys! Show some modesty. Because I use my reasoning to asses anything, I had to put this marketing hype behind, and look at the stats. Their product is a best seller on Amazon for its category. That means something; actually, that means a lot. We all know that occasionally Amazon reviews can be faked, but that only happens with 10-20 reviews, and certainly, that doesn’t increase sales. A best seller on Amazon is always there because it’s a great product. If you go with the well established brands you will have to pay the price, all the renowned brands are more expensive than the up and coming companies. If you randomly start to try products on the market, you might lose more money trying to find a good inexpensive product. Losing confidence in a product that should work is not good either. You find a probiotic supplement that seems to work, but you have to take double the recommended dose in order to work. This obviously becomes more expensive. The encapsulation technology makes the difference, since the live microorganisms have to be delivered in the gut, and pass safely through stomach acid. The encapsulation technology, and the inactivation in the capsule or pill, also is important, because it will determine the shelf life and the stability at room temperature. There are supplements that can only be stored in the fridge, and these are great options, which work wonderfully, but the delivery assumes the bacteria can pass alive through stomach, and you have to make sure you store them properly, and they have been stored and transported in proper conditions, before getting in the store. Best supplement doesn’t necessarily mean the best for you and a great example why, is my comparison between Florastor vs Align. The encapsulation is the innovative Bio-Tract, to improve viability of the microorganisms. The strains in the blend are selected with care, combining not only diversity, but also a specific blend that you won’t find in other products. Some of the strains in this blend are the most effective and inexpensive for tackling Candida infections. Read more about probiotics for Candida treatment. The product is sold in 60 tablets bottles and they don’t sell larger ones. This ensures the microorganisms are live until you finish the bottle. Probiotics start to degrade once the bottle is open, so packaging in larger container doesn’t make sense for efficacy. The tablets are the pea size, very easy to swallow compared to other brands on the market. Which Strains does it need to Contain? This is a little more complicated, because probiotic microorganisms are “specialized” and some might help with a condition and another one might help with a different condition. Although many strains overlap, and many have a wide range of conditions where they are helpful, most of the times you need to choose a specific strain. Usually, companies will let slip the perceived benefits of their probiotic supplements, but they cannot make any claims because these are not approved by FDA. FDA won’t allow any probiotic manufacturer to claim and health benefits. Some companies are bold, and market their products as being effective in the treating various conditions, but most of them will phrase their statements very carefully. An example is: “may be effective in treating bloating”. The safer approach is to list the benefits of the strains contained, based on the scientific research. And again, they will list it as “may be beneficial to those affected”. I am not going to go very deep into the inactive ingredients list, but just mention that the probiotic is non GMO, Soy and Lactose free, Wheat free, and it doesn't have sugar or artificial colors. For a full disclosure, on their product page, Hyperbiotics do admit that there might be trace amounts of milk from the manufacturing process, however, the amount is so small it can't cause any problems. Going back to the probiotic blend, with 5 billion CFU per serving, the amount of live organisms doesn’t seem as impressive as other products on the market. For instance, Complete Probiotics from Dr. Mercola has no less than 70 billion CFU. But on the other hand, respected brands such as Align Probiotic, and Pearls from Enzymatic, with a mere 1 billion CFU are among the best supplements on the market. Yes the number of live counts per unit is important, but you have to take in consideration the strains in the formula, the synergistic action between the different strains, and the delivery method. Follow the link for a comprehensive list with probiotic supplements. As a VSL#3 fan, I tend to compare it with any probiotic supplement on the market. At the end of the day, VSL#3 is one of the most researched probiotic blends, and one of the most efficient. It is hard to miss that Hyperbiotics Pro-15 contains 7 of the 8 strains in VSL#3. This is a good thing, because this blend is proven to work on a variety of gastrointestinal problems, but that is not the only health benefit of this supplement. Lactobacillus plantarum, which can reduce the intestinal permeability. It also reduces gas bloating by killing the gas producing bacteria in intestines. Lactobacillus rhamnosus, another important strain of the blend, will also affect permeability of the intestines, reducing the IBS symptoms. Rhamnosus is also a great help for respiratory and urogenital infections, and against diarrhea. Lactobacillus acidophilus is the most used bacteria in probiotic supplements. It produces lactic acid and hydrogen peroxide that kills pathogens. Used after antibiotic treatments, it treats constipation, diarrhea, other inflammatory conditions such as IBS and Crohn’s. It reduce cholesterol levels. Bifidobacterium infantis contributes with cleaning up bad microorganisms in your guts, thus it will help with IBS. It also produces highly bioavailable B vitamins, (B12, B9, B7, B3, and B1). It improves digestion, and appease intestinal discomfort. Lactobacillus casei helps lactose intolerant patients because of its ability to convert lactose into lactic acid. It is also a major factor in promoting the increase of other beneficial bacteria populations. Lactobacillus reuteri is also an important piece in the puzzle of sanitization of our intestines, and reuteri alone can kill a lot of pathogens, including H.pylori, E. coli, and Streptococcus mutans. Streptococcus thermophilus is a very popular strain in the dairy industry, being used to ferment milk products such as yogurt and cheeses. Because its remarkable ability to ferment milk, S. thermophilus is a great help for lactose intolerant people. There is also evidence that it can lower the risk of lung cancer. Lactobacillus salivarius is not only present in our mouth, it is also an important part of our gut microbiome, where it keeps in control opportunistic microorganisms and pathogens. Because of its ability to kill bad bacteria, it also alleviates gas and bloating symptoms. Lactobacillus gasseri can help with weight control, breaks down oxalates, a substance that can cause kidney stones and can increase inflammation, (useful for IBD patients). It also reduces cholesterol and helps with respiratory problems. It also fights pathogens because it produces lactic acid and hydrogen peroxide. Lactobacillus paracasei, like many other native intestinal bacteria, is a chemoprofylactic, which means it can prevent infections. It is also proven effective for treating pollen allergies, and diarrhea in infants. I was also found effective for patients with chronic fatigue syndrome. Lactobacillus reuteri is probably most famous because of the three bacteriocin substances that it produces: reuterin, reutericin, and reutericylin. These bacteriocins can kill a variety of yeasts and bacterial pathogens, helping us maintain a healthy intestinal microbiome, and preventing infections. It also mediates the immune system. Treats diarrhea, baby colic, abdominal pain and discomfort, and fights H. pylori. Lactobacillus fermentum is a powerful antimicrobial, with some strains having powerful antioxidant properties. It can prevent the growth of bad bacteria, yeast and other pathogens. I t is a great booster of your immune system. Bifidobacterium bifidum can be used to treat diarrhea, (infectious diarrhea and antibiotics associated diarrhea), and some strains alleviate IBS symptoms. Bifidobacterium longum is one of the most important inhabitants of our gut. It is reported to have an important role in modulating the immune system, decrease the risk of cancer, and some strains reduce the symptoms of flu infection. It breaks down carbohydrates, and reduces the effects of seasonal allergies. It also regulates the mood and relieves anxiety. Bifidobacterium breve competes with pathogens, and appeases symptoms of diarrhea, allergies, gas, and IBS. B breve ferments sugars and converts them into lactic acid and acetic acid. This will modify the pH of your intestines, creating a good environment for the good bacteria. Bifidobacterium lactis can fight Helicobacter pylori in the stomach. H. pylori infection can cause gastritis, abdominal pain, bloating and acid reflux. B. lactis strengthens the immune system, and it is also helps coeliac disease sufferers. It is worth mentioning that the blend also contains 25 mg of prebiotic fiber, (FOS), to boost the effect of the probiotics. The combination of probiotics and prebiotics is called a synbiotic, and by adding a prebiotic fiber in the blend we give the microorganisms a boost, by feeding them food that stimulates their activity and multiplication. Ensuring a long enough shelf time without loss of counts, by protecting against oxygen, and moisture. Relative stability to temperature changes. Safe passage through stomach, surviving bile and stomach acid. Timed delivery in the intestines. Hyperbiotics encapsulation uses the patented Nutraceutix’s Bio-Tract technology, for ensuring perfect delivery in the intestine, and not in the stomach, and for timed delivery. Bio-Tract are better for targeted and timed delivery than the enteric coated products, not talking about non-enteric coated ones. Here is more about Bio-Tract from Nutraceutix. 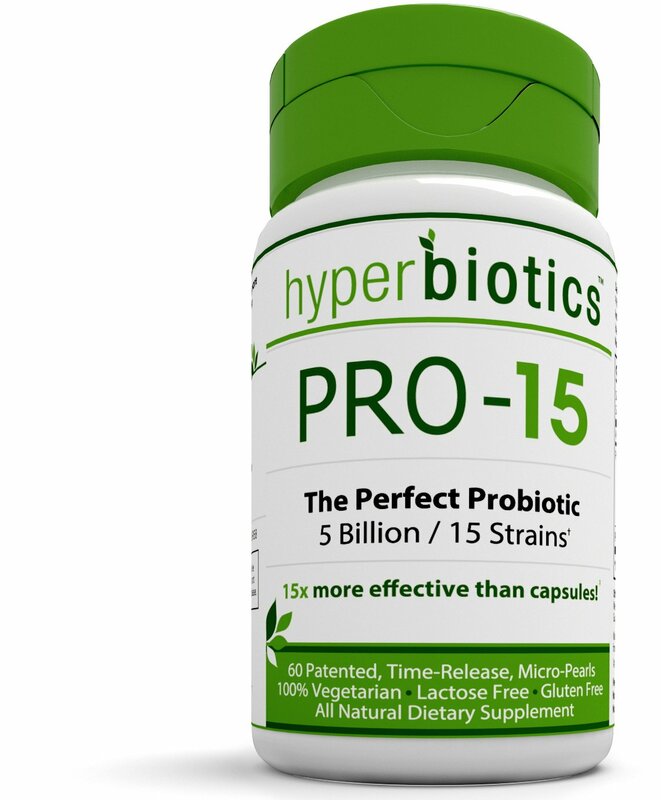 Hyperbiotics is certainly one of the contenders for a place in the top probiotic supplements. When we add in the equation the price, which is affordable, we understand why it is the best seller in its category. Although probiotics are regarded as generally safe to take, there is in many cases mild abdominal discomfort associated with taking a probiotic. This doesn't happen with all probiotics, and usually the symptoms are transient, disappearing after 3 to 8 weeks of use. There were some complaints from customers that their formula caused gas and bloating. This is absolutely normal for people with an imbalanced microbiome in their guts. The new formula contains Kiwi extract, a powerful, efficient prebiotic, to ease up with these symptoms. Additionally, the new formula contains three times the CFU versus the previous product. Hyperbiotics contains 15 strains of beneficial bacteria, which is more than what contain most of the products from the competition. Seven out of eight species are similar to the well known VSL#3. In all fairness, we aren't sure what strain they are using, and many manufacturers will keep that as a secret. But the reality is that their product works. We also would like to see some scientific research, or clinical trials with their product; until now, we only have Amazon’s reviews which are great, by the way, but it’s not enough.